(On the photograph : Front Dr. George Kiraz, Founder and President of Gorgias Press, fr. Kevin Stwphens, OP, fr. Lukasz Popko OP, Dr Eugen Pentiuc,, fr. O.T. Venard OP, Dr. James C. Skedros, Dean of Holy Cross, Paul Peeters, President of Peeters Press Back: Fr. Philip Zymaris, Assistant Professor of LIturgics (Holy Cross), Fr. John Behr, Former Dean of St. Vladimir’s Seminary and Professor of Patristics (St. Vladimir’s), Dr. Philip Mamalakis, Assistant Professor of Pastoral Care). Holy Cross Greek Orthodox School of Theology, in conjunction with École Biblique et Archéologique Française in Jerusalem, hosted a reception on Sunday, November 19, to celebrate the publication of the Project's latest book, Hosea: The Word of the Lord that Happened to Hosea, released just the week before by Peeters Publishers. Its main contributor, Fr. Eugen Pentiuc, a prolific author, is Professor of Old Testament and Hebrew at Holy Cross and Hellenic College Holy Cross Associate Dean for Academic Affairs. Paul Peeters, whose family has published important scholarly works since 1857, came from Belgium to make the formal presentation of the new volume at the reception. The new monograph on the Book of Hosea, represents the tireless work of a group of international biblical scholars. Hosea is the second volume, after Philippians (Peeters, 2016), to appear in The Bible in Its Traditions series recently launched by École Biblique in Jerusalem. Fr. Olivier-Thomas Venard, o.p., B.E.S.T. 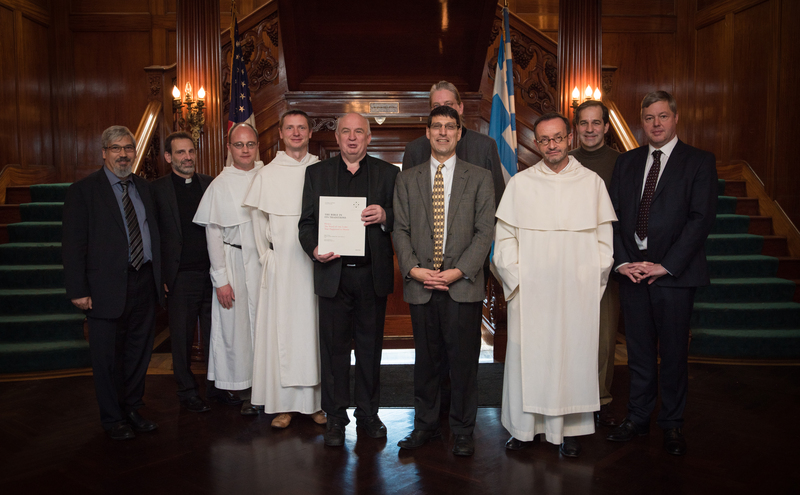 Executive Director, and several colleagues traveled from Jerusalem (Fr. Lukasz Popko o.p.) or St-Louis (Fr. Kevin Stephens o.p.) for the book launch. “It’s a great pleasure for me to honor my friend, Fr. Eugen, today,” said Fr. Venard, “…and we are thrilled to inaugurate our English-language series in an Orthodox institution. It’s a dream come true to be with you today.” Fr. Pentiuc thanked Fr. Venard and all those present for acknowledging his efforts, but insisted that “this is a collaborative work." The B.E.S.T. continues a long tradition of École Biblique, which created the first Study Bible, La Bible de Jérusalem (1956), adapted in English as The New Jerusalem Bible. The new digital Study Bible offers the modern reader a fresh scriptural translation based on the Old Greek (Septuagint and second-century A.D. Jewish translations), Hebrew (Qumran and Masoretic), Syriac (Peshitta), and Latin (Vulgate) texts, accompanied by a wide variety of study notes divided into three sections: text, context, and reception. The layout for each volume in this series attempts to imitate the Medieval Glossa Ordinaria (“Standard Gloss”), consisting of patristic annotations placed in the margins of the Latin Vulgate of Jerome. This ingenious layout emphasizes the polyphonic centrality of the biblical text as well as the irreducibility of the rich and multifaceted interpretations that the former has generated in various communities of faith throughout the centuries. Hosea: The Word of the Lord that Happened to Hosea Launch Nov 19 2017 from St Vladimir's Seminary on Vimeo.